Location: On the east side of Station Road at the end of a short approach road. Notes: Ushaw Moor Station originally had one platform face but was later converted into an island platform with the addition of a subway, this was later replaced by a footbridge some time after 1923. It retained its original wooden platform building. When the station opened it didn't have a freight facilities only handling parcels as shown in the 1904 RCH handbook. Some time after that date a small goods yard was opened to the east of the station comprising a single siding serving a small goods dock with a crane. The Deerness Valley Railway was incorporated by an Act of Parliament of 30.7.1855 and was sold to the North Eastern Railway on 13.7.1857. The line opened for goods on 1.1.1858 from Deerness Valley Junction on the Durham to Bishop Auckland line to a point near the junction of The Stanley Incline and the line to East Hedley Hope Colliery. 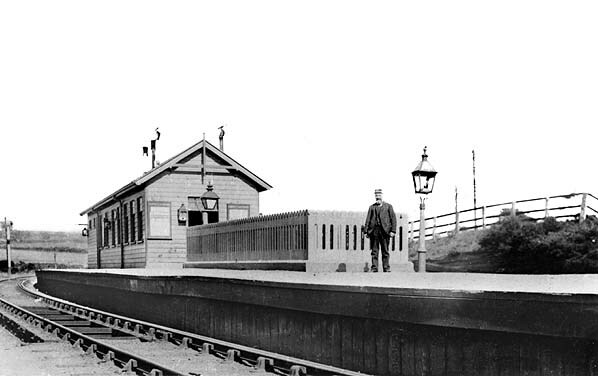 A passenger service wasn't introduced until 1.11.1877 when a single platform terminus was built part way along the line at Esh Winning, the station was named Waterhouses; passenger trains never went beyond Waterhouses. A second station was added at Ushaw Moor on 1.9.1884. The passenger service on the line was always of secondary importance with a number of collieries being accessed from the branch. The final box was at Waterhouses Station. 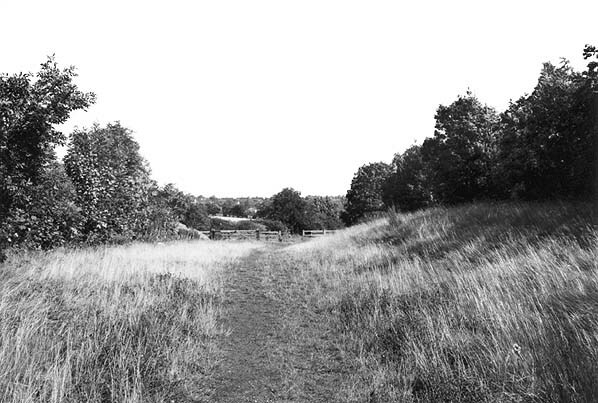 Beyond the East Hedley Hope junction, the line was known as The Stockton & Darlington Railway Deerness Valley Branch with the rope worked Stanley Inclines giving access to Stanley Drifts and Wooley Colliery and on to Bank Foot Coke Works and Chemical Plant at Crook. It was built for Joseph Pease & Partners the owners of Waterhouses Colliery, who also owned the complex at Bank Foot. In 1922 there were nine trains in each direction with and additional service on Wednesdays and Saturdays but no Sunday service. During the 1930's excursion trains used to run Saturday nights to Newcastle with summer Saturdays to Whitley Bay and South Shields. 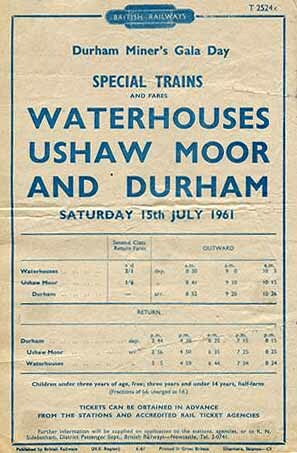 In October 1949 the passenger service was reduced to one train per day to Durham Monday - Friday and the passenger service was withdrawn altogether on 29.10.1951 by which date Bradshaw only lists one daily down train at 8.17am. 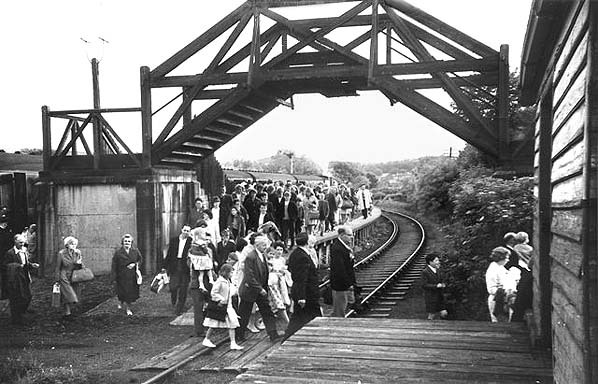 The two stations remained in use until the 1960's for occasional miners' gala trains with morning passenger trains taking bands, banners and passengers into Durham and bring them back again in the afternoon. The freight service continued until 28.12.1964. The line originally had two wooden trestle viaducts; the viaduct over the River Deerness to the west of Ushaw Moor station was demolished in the winter of 1967/68 when the track was lifted. 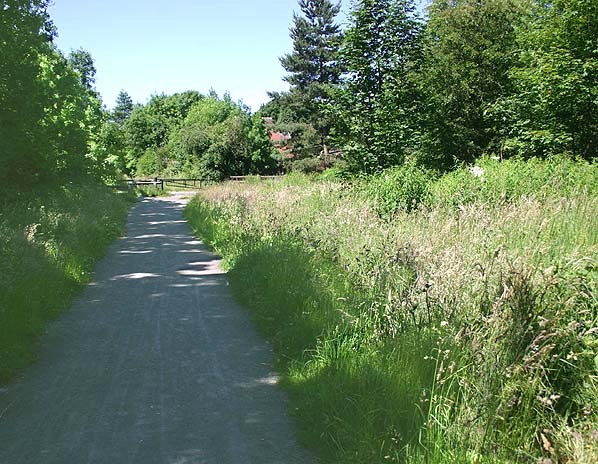 The line has now been converted into the 8 mile Deerness Valley Railway Path which starts at the Broompark Picnic Area and passes through the villages of Ushaw Moor and Esh Winning. County Council ownership terminates on meeting the B6299 near Stanley Crook. A further section links to the B6298 on the outskirts of Crook. Durham Miner Project web site. Tickets from Michael Stewart. Route map from Alan Young. 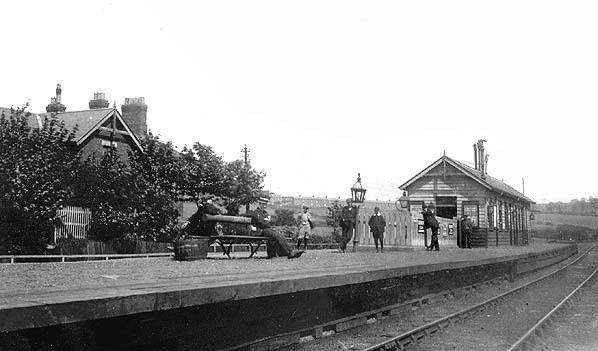 Ushaw Moor Station in 1890 before the footbridge was erected. 1890 1:2,500 OS map. At this time the island platform was accessed by subway which can bee seen to the left of the main station building. The station had no goods yard at this time. 1923 1:2,500 OS map. A small goods yard is now shown to the east of the station comprising a single siding, a small goods dock and a crane. The subway is still shown. 1961 1:2,500 OS map. 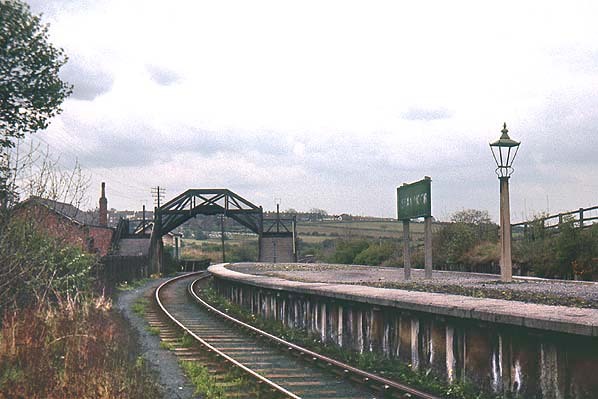 Although the station is now closed to passengers it remained open for goods traffic until 1964. The footbridge is now shown and the subway has gone. 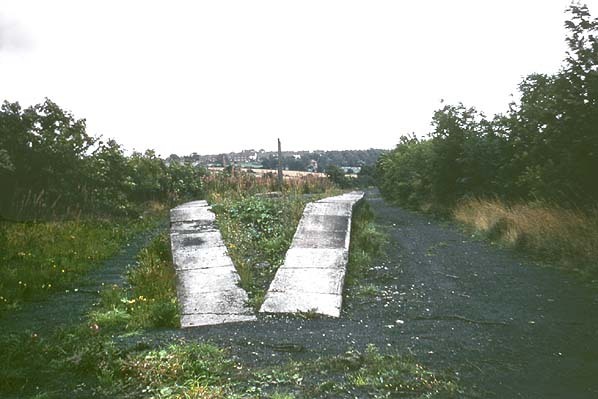 Ushaw Moor Island Platform in the early 20th century with the original subway before the footbridge was built. The main station buildings (at the other end of the subway) together with the Station House and the Station Hotel are behind the trees to the left. 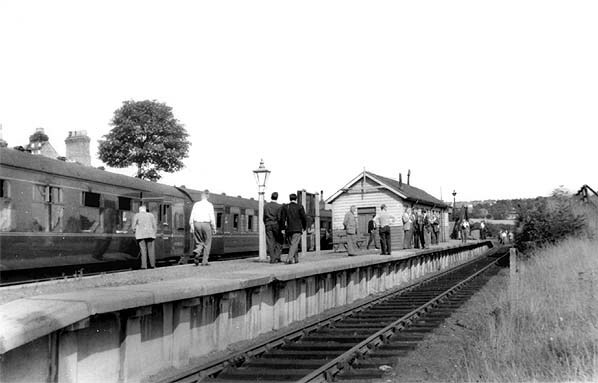 West Durham Rail Tour visits Ushaw Moor station on 31.8.1958. A seat now sits on the top of the infilled subway.